0.9mm thick steel, designed to maintain its integrity during the early minutes of exposure to fire. 2-point lock with chrome handle, ensures access is limited to authorised personnel. GHS COSHH flammable label supplied on the cabinet. Perforated 100kg capacity shelves allow spillages to drain into a liquid tight sump tray. 80mm deep removable sump tray to contain any spillages. Fully sealed base with point welding, to prevent leakage at ground level. Height adjustable shelf trays, to accommodate different size storage containers. 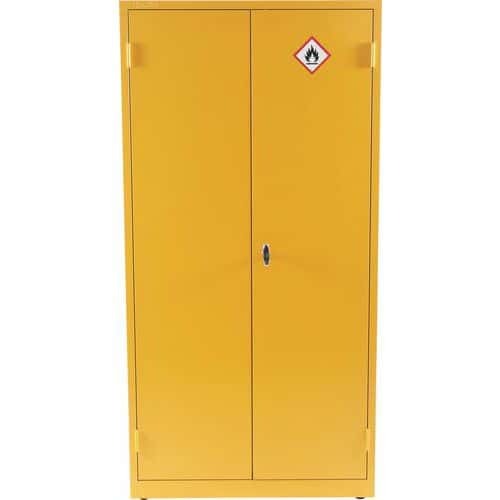 Large robust COSHH cabinet suitable for the storage and segregation of flammable substances.